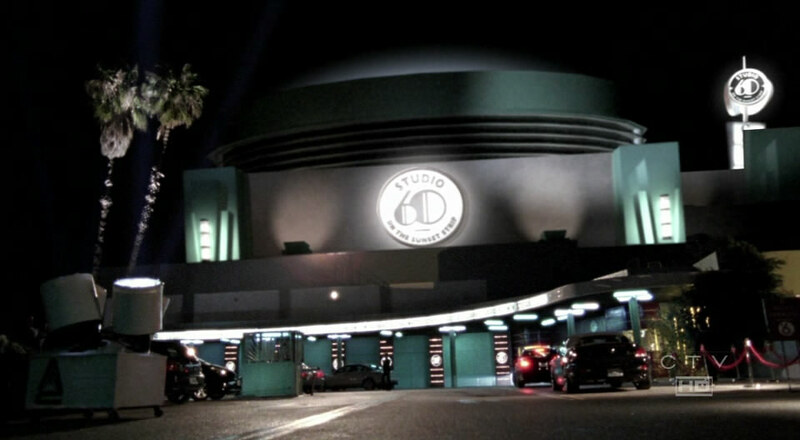 The most anticipated show of the 2006 Fall television season was Studio 60 on the Sunset Strip. 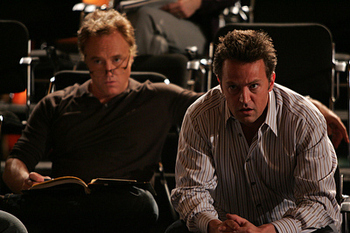 Critics called the pilot “the best of the season”, NBC pushed it significantly in their Fall promotions, it had a high-profile and well-known cast, and it was produced and written by Aaron Sorkin, who recently had the huge success of The West Wing and the critically acclaimed Sports Night. Each of those other shows had taken certain settings (politics and ESPN) and treated them as the background for some terrific characters, storylines, and glimpses into worlds that normally don’t get the “television” treatment. So, there were high expectations for Studio 60 to do the same for the world of television itself, especially the behind-the-scenes craziness of something like a Saturday Night Live styled series. If Studio 60 on the Sunset Strip had been that kind of success, it would not have ended up on this blog. On the series, the fictional NBS network has to reinvent their flagship (and former standout) comedy show Studio 60, after its current producer (Judd Hirsch, in an excellent guest-star turn) has an on-air meltdown. Two former producer/writers are brought in to revamp and revitalize the show: Danny Tripp and Matt Albie (Bradley Whitford and Matthew Perry, respectively). They have a history with Studio 60, and not the smoothest one: Matt used to date current female star Harriet Hayes (Sarah Paulson), while Danny ended up with a drug problem due, in part, to the pressures of running the show. Simon and Harriet at the "Studio 60 Newsdesk"
Other stars of the Studio 60 variety show include Tom Jeter (Nate Corddry), originally from the midwest and great at impersonations but not so great at just being himself, especially to the family “back home”; and Simon Stiles (D.L. Hughley), the comedian who’s incredible funny… but who would much rather be taken seriously, both as an actor and as a person. The other regulars are “behind the scenes” characters Cal Shanley (Timothy Busfield) as the current director of this menagerie, and network honchos Jack Rudolph (Steven Weber), chairman of NBS, and his recent (and young) hire Jordan McDeere (Amanda Peet) as President of Entertainment Programming (and the immediate boss of the new producers Danny and Matt). Yes, that’s EIGHT main characters, and all got featured heavily, and quickly, even in the pilot. This series was about the behind-the-scenes of a Saturday Night Live type show, and everyone has a lot to do, and every character is under pressure to do it well, and do it quickly. It’s a signature Aaron Sorkin series, with lots of “walk and talk” scenes with multiple characters, snappy dialogue and something unexpected happening all the time. It also has lots of supporting players (at least 20 other people appeared at least twice in different episodes, and most appeared in the majority). In other words, we saw the entirety of how a Saturday Night Live type show like this is put together, and how the fitting of the pieces can be funnier (and more poignant) than the actual 90 televised minutes each week “live from Studio 60” itself. We got to see, not just the process, but the inter-personal by-play that made these types of productions pressure-filled, rewarding, and devastating, sometimes all at once. And it played a bit like Saturday Night Live in that there were both stand-alone stories (sketches on SNL) and continuing narratives (much like recurring characters on SNL). On the fictional Studio 60, we saw actors figuratively stab each other in the back, entire writing staffs leave en masse, pressure groups objecting to barely objectionable material, and even the strangeness of a giant snake lost in the bowels of the theatre. Spit-takes are juxtaposed with bomb threats. Corporate takeovers depend on not just ratings, but on fangirl angst. And these are just the problems… Studio 60 still had to bring the “funny”, and they did so, consistently. Studio 60 on NBS became a water-cooler show again, talked about each week, and can’t-miss television. And although Studio 60 on the Sunset Strip on our home screens did an excellent job of mixing comedy and drama as well, it apparently wasn’t good enough, or the expectations were too high, because the series was canceled by NBC after 22 episodes. The storyline on the show was how to take Studio 60 (a busted show) and create a new buzz around it, and make it successful again. Fictionally, it worked, with interesting stories and diverse characters. But in real life, Studio 60 on the Sunset Strip went from buzzworthy to cancellation within a year… and amazingly, the reasons are similar, only in reverse. Money is a big reason. After the success of The West Wing, producer Aaron Sorkin was in demand, and first there was a rather spirited bidding war between networks for his next series, Studio 60. Struggling NBC won, and poured large amounts of money into promotion to trumpet the fact that they’d gotten the next series “from the creator of The West Wing and Sports Night“. Eight regulars, and 20 or more semi-regulars, meant more salaries and more money. Instead of filming on a regular soundstage, the production company actually bought an old theatre and created the entire stage area AND backstage (writer’s room, production headquarters, offices, prop rooms, costume and make-up areas, dressing rooms, etc.) and used them ALL for the “walk and talk” style of presentation — on two floors, with stairways (that equipment had to fit through as well). This meant that you may get an entire five-minute scene in one take, over multiple “locations”, but it took literally three HOURS just to light it, and one mistake while shooting along the way meant you had to do the whole thing over again… which meant the five minutes took five HOURS to film, AFTER the lighting and such. You’ve just spent half a day or more to shoot five minutes of footage. Stylistically, it looked incredible, but… in Hollywood, time is money. You’d better be getting the ratings to deserve this kind of money, and NBC was counting on big ratings. Unfortunately, there was a laundry list of other problems, some outside the series, but directly affecting it. NBC was going through their own corporate shake-up at the time, and although the circumstances were different, the effects of pressure and uncertainty were the same, and the spending of money was one of the issues. The series may have been just a bit too “inside”, as far as TV knowledge and production, for the average viewer. Pairing it with the first breakout hit of the season, the new (and also expensive) Heroes didn’t help, as they were two completely different animals. Amanda Peet became pregnant early during production, and the pregnancy had to be written into the show (even though her character was designed to be career-oriented, single, and unattached….). Oh, and one last thing you should know… television people love to talk about television. Critics thought this show would be their darling of the season, and then the ratings started to drop off significantly (over 40% from its premiere). And since television people still loved to talk about television (and the loudest are the critics), the talk went from “how wonderful this show will be” to “how doomed this show is”. On Christmas Day, Studio 60 got a box of rocks for a present, as a TV critic for the L.A. Times wrote a scathing piece on the show, knowing that the series was on a scheduled 7-week hiatus during the holidays (and therefore unable to defend itself, or even have a presence on television). The series resumed in late January, ran five more weeks, and then was officially “canceled”, with the remaining six episodes burnt off in late May and June, after its fate was already sealed. In fact, NBC had announced their “new” Fall schedule for that following season already, just before bringing back Studio 60 on the Sunset Strip. This was simply NBC “playing out the string” on shows they’d already spent the money for. Later, in July, the show was nominated for five Emmy awards (winning one), and also winning various Writers and Directors Guild Awards, and a Golden Globe for Sarah Paulson. Not bad for a “best new fall series” that had already gone “bust”…. 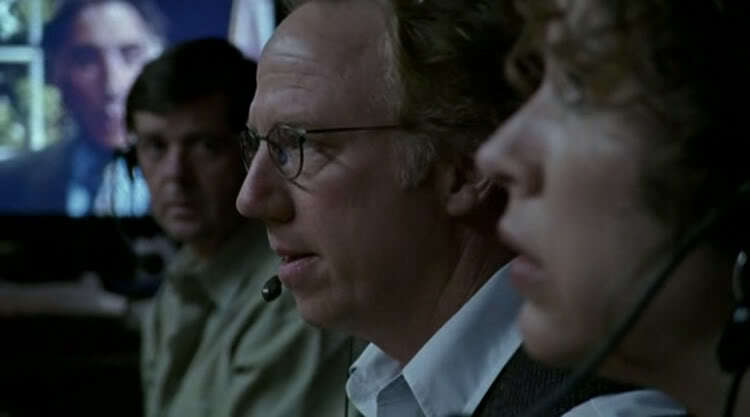 The series is readily available on DVD, with a backstage “tour” included as one of the extras, along with commentary on the pilot episode by Sorkin himself. Individual clips of various episodes and moments are also available on IMDB as well as the complete season or individual episodes on Amazon on-demand and iTunes. NBC even had a fictional NBS website to promote not just the show, but the fictional “network” as well. Unfortunately, all that is left on that site is a “hello” letter from characters Danny and Matt, with thanks for the 20-year “history” of the show, and the promise of its new future with them at the helm. If only…. BRADLEY WHITFORD (Danny Tripp) is best identified with his character Josh Lyman on The West Wing, and is currently starring in The Good Guys on FOX as a drunken cop. He also directed the final episode of Studio 60 on the Sunset Strip, and has also hosted the real Saturday Night Live. MATTHEW PERRY (Matt Albie) is, of course, known as Chandler Bing on the long-running series Friends, for which he was nominated for an Emmy. His current project is a new fall series on ABC called Mr. Sunshine… and he also hosted an episode of Saturday Night Live. SARAH PAULSON (Harriet Hayes) has come a far way from being the little girl Merlyn Temple on American Gothic (Her “Someone’s at the door” is still one of the best scary moments on TV). She was also a regular in the series Jack and Jill, appeared in 9 episodes of Deadwood, and played the psychiatrist in the 2009 revival of Cupid. 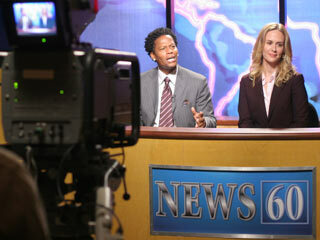 NATE CODDREY (Tom Jeter) started his TV comedy career as a “correspondent” on The Daily Show with Jon Stewart. After Studio 60, he spent a year in the touring company of the Broadway revival of The Graduate, and is now playing a recurring character on the United States of Tara. D.L. HUGHLEY (Simon Stiles) hosted the Premium Blend stand-up series for Comedy Central, then went on to produce and star in The Hughleys sitcom for ABC and UPN. He has appeared on numerous shows as a comic, commentator, and currently hosts a radio program in the L.A. area, in addition to shooting a pilot recently for a game show. TIMOTHY BUSFIELD (Cal Shanley) scored his biggest success in the series Thirtysomething, winning an Emmy, and now, in addition to acting, is in demand as a director for television. He was also a producer on the series Lipstick Jungle, Without a Trace, and Ed. It’s not surprising he played a director on Studio 60, as he actually directed a quarter of the actual episodes. STEVEN WEBER (Jack Rudolph) started acting in the third grade, and his career has never stopped since. Best known as one of the stars of the long-running sitcom Wings, he’s also appeared on Broadway (taking over for Matthew Broderick in The Producers) and had recurring roles in series such as Without a Trace, Brothers and Sisters, In Plain Sight, and got the “short series” treatment in Happy Town (as the rest of its episodes are only airing on the internet). AMANDA PEET (Jordan McDeere) is known more for her movie career than her television work, and for once being named one of People Magazine’s “50 Most Beautiful People”. In addition to being featured in the movie The Whole Nine Yards (and its sequel, The Whole Ten Yards), she’s also starred in the cult film Griffin & Phoenix and appeared on Broadway in the 2006 revival of Barefoot in the Park. She was recently seen in the big-screen disaster epic 2012. The other “inside television” item that came out of the airing of Studio 60 on the Sunset Strip is rather important, as far as exactly HOW television works these days. The series aired during the first season that Nielsen ratings started tracking numbers for DVR watching of a show for the following week, as well during the original broadcast (now called “live +7” ratings). Unfortunately, due to the newness of the system, they did NOT include those numbers in the reports of the ratings of Studio 60 that season. And, according to Nielsen, if those numbers HAD been included (as they are now), they would have added another 11% (almost a million viewers) to the ratings of Studio 60, most likely in more upscale homes (who had the money to AFFORD those newfangled machines then), and the series likely would have been renewed on that basis. In other words, if television can consistently figure out how its OWN systems should work, maybe we’d end up with better television. And shows like Studio 60 on the Sunset Strip would still be on. But until then, the best we can hope for is the organized chaos that goes into EVERY show, and hope they get enough of it right to still be entertaining, interesting, and fun. And that the bean counters get their end figured out as well, or it’s gonna be “best to bust”, every season, for somebody. Outside Studio 60 on the Sunset Strip. Please turn out the lights. Aired at Friday 8/7 Central? No, All episodes aired on Mondays at 10/9 Central, although the fictional Studio 60 within the series supposedly aired on Friday nights!